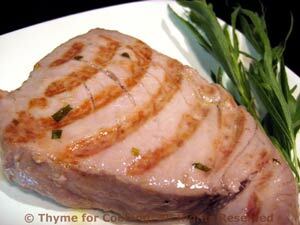 Marinated Tuna with Lemon, Tarragon, Thyme for Cooking healthy gourmet. If you get sushi-grade tuna you will definitely want to have this rare (it has to be graded to a higher standard so it is okay to eat raw). Regular tuna we normally have medium. Well done tends to make it rather dry. This is a simple preparation, finished with a bit of sea salt. Put tuna in a dish with deep sides. Mix all ingredients for marinade, pour over fish and let marinate for 10 - 20 minutes, no longer. Remove from marinade and cook on barbecue grill for 4 - 6 minutes per side (depending on thickness) for regular tuna, 2 - 3 minutes for ahi. - or until done to your liking.